On monday I took my chance and had a nice camera walk in the sunshine of Heidelberg. To challenge myself I took a lens with me that I barely use. The Ernst Leitz Wetzlar Summar f=5cm 1:2 (Leica Summar 50mm f2). The little Ernst Leitz Wetzlar Summar was built between 1932 and 1939 and is still yet a really sharp and superb lens. Its made out of six elements and has six aperture blades. 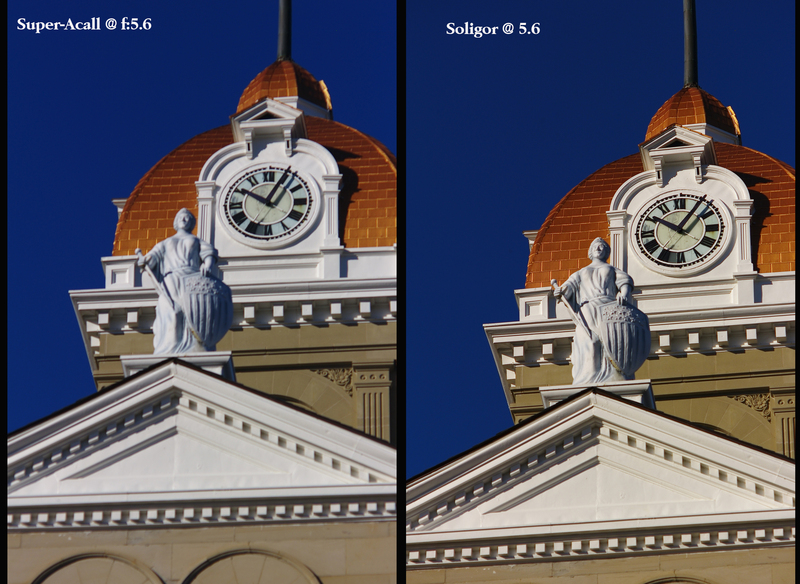 Even on modern 42 megapixel camera the lens is really usable. When its open at f2 its sharp in the middle with a slight vignetting and really soft corners. When you stop it down it becomes a really really sharp lens. The bokeh is bubbly and swirly really similar to the Helios 44 lenses. The following article is a guest post by Jim Headley. A few years ago, I was rather bored and went onto the Internet for some entertainment. I often type Leica in the auction website and just browse the closing auctions for a bargain. I quickly located a Leica IIIC stepper and bought it for under $400, with a clean 50mm collapsible Elmar. During my browsing I also located two 135mm lenses for sale. Both were in 39mm Leica Thread Mount and the auction was about to end with no bidders. I slapped down a $27 bid, only to find out in a few minutes that I was now the proud owner of these two 135mm lenses for a paltry $19.99. I quickly paid for them ($24.99 with shipping). I really didn’t care about these lenses as my big prize of the day was my fourth IIIC stepper to add to my collection. I could not sleep that night as visions of the two lenses danced in my head. The weekend came around, so I decided to put the two “sleepers” to the test. I’ve always hunted for the perfect M-mount 135mm lens – even to go as far as cutting off the eyes of a Leica 135mm f:2.8 Elmarit. The eyes were scratched beyond use, so please don’t gasp. My Elmarit performs well but it doesn’t focus accurately on the rangefinder patch of my M8. It’s great at infinity but difficult to focus on anything very close. I was using it on a Micro 4/3 camera and it was splendid. I have always struggled to find a great 135mm lens and with the 1.3x crop of my Leica M8 chip, the 135 effectively becomes a 175mm. That is a “nice” focal length to use. I took the two sleeper lenses down to the local dam on the Little Blue River as well as performing a test on the top of the local courthouse. WOW! I am amazed by both the Kyoei Super-Acall and the Soligor. They are indeed sleeper lenses and better that all the 135mm Hektors that I have owned. I first gravitated to the larger and heavier Kyoei Super-Acall but I finally relented and picked the less-impressive Soligor. I mean come-on with a name like Soligor it can’t be that great. To my surprise the Soligor rated and tested as the best of the two when I went through a series of detailed head-to-head quality tests from wide open at f:3.5 to f:22. The Soligor was tack sharp at f:11 while the Super-Acall was a little softer. 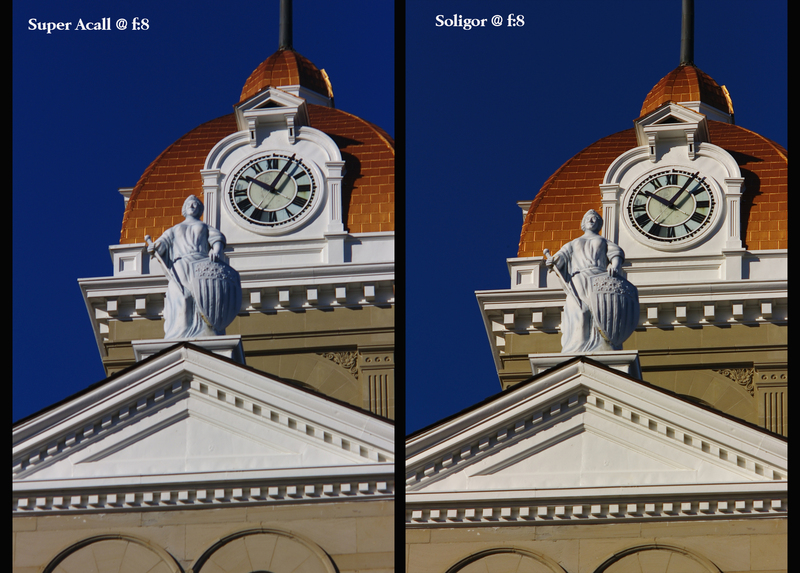 Both lenses had fantastic color retention but I found the little Soligor was a little warmer while the Super-Acall had nicer blues and cooler tones. 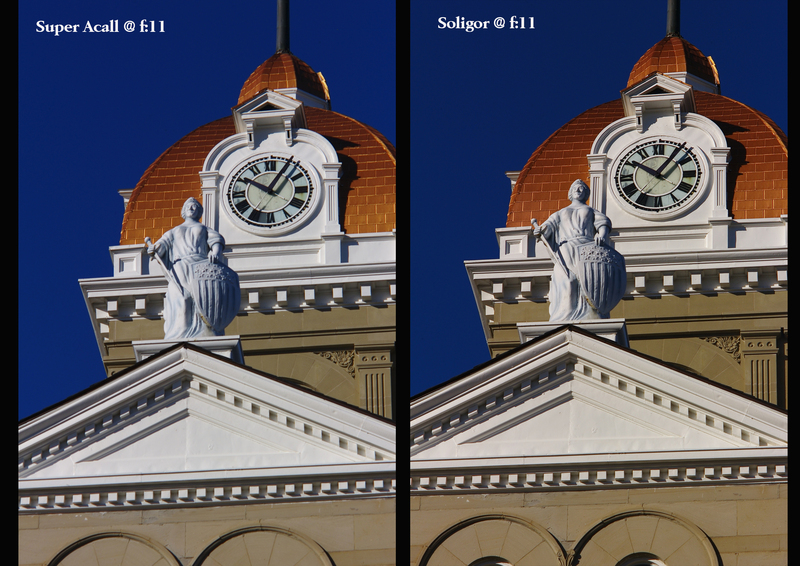 At f:16 and 22 both lenses were sharp with great color retention but the Soligor was just a little better. So if you have been hunting for a reasonably priced 135mm lens to snap onto your digital (or film) Leica, please take a look at the Kyoei Super-Acall and the Soligor 135mm f:3.5 lenses. They are sleepers and many are discovering their unique charm and quality, so they are beginning to rise in price a little. I was incredibly lucky to find them together in one auction for $19.99. The Kyoei Super-Acall normally is in the $200 to $400 range while the “better” Soligor is $200 to $300 if you can find them on the used market. They both make a great telephoto on an M-mount Leica with a good adapter.